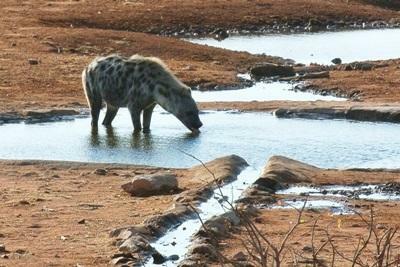 The summer is slowly setting in at Wild at Tuli and the first rains arrived with a total of 12.1mm of rain over two days. More rain is, of course, still needed but it’s sure to be on its way. The temperature is gradually increasing and we have seen heights of 50˚C and lows of 19.5˚C, which makes it hot but still bearable. The trees are starting to sprout new leaves and the bushveld is returning to its lush state. This pleases everybody as the animals can enjoy fresh leaves and the volunteers can watch nature flourish. Even the mopane moth (Gonimbrasia belina) is busy laying eggs in the trees. These last two months have been incredible for us at Wild at Tuli. The volunteers have been working hard to improve the reserve and to protect the wildlife by cutting back trees, which could obstruct visibility on the roads and cause accidents. They have also helped to build a new road, to make dams and to create barriers to prevent soil erosion. As always in the bush, there have been some incredible sightings. A leopard (Panthera pardus) called ‘Bond’ was spotted lying on a dead tree and we have captured some nice footage on our camera traps of our brown hyena (Parahyaena brunnea) and her three cubs. We have also come across more lion tracks (Panthera leo) and we saw over 70 elephants (Loxodonta africana) in one sighting. We have also seen giraffe (Giraffa camelopardalis), the spotted hyena (Crocuta crocuta), the grey-headed kingfisher (Halcyon leucocephala), the red-faced mousebird (Urocolius indicus), the southern pied babbler (Turdoides bicolor), and the red-headed weaver (Anaplectes melanotis) was spotted nesting in front of the communal bathroom. For two days in a row, we were visited by our well-known “Captain”, a solitary bull elephant that likes to drink from the bird bath and feast from all the trees around the camp. Unfortunately, he is a bit naughty though and he likes to destroy all the small solar lights at the camp. That said, all of the volunteers have really enjoyed his visits and watching him from such a close distance. The whole team wishes to take this opportunity to thank all the present and past volunteers for their hard work, which has made a huge difference to the environment. We hope you all enjoyed your time with the Wild at Tuli family! We also hope you will enjoy this latest update and learn a lot of interesting facts about African wildlife and life in the bush. We have also given you some tips about how you can make a difference back home by reducing your impact on the environment. The tarmac road is Botswana’s highway and connects the reserves in the far south to the main cities of Bobonong, Pikwe and Francistown. The problem on this road is the speed of the drivers and the lack of visibility along the sides. The mopane tree (Colophospermum mopane) amongst others has been growing rapidly for at least three years, which decreases the visibility along the sides of the road and makes it very dangerous for wildlife. African elephant (Loxodonta Africana), impala (Aepyceros melampus), plain zebras (Equus quagga), greater kudu (Tragelaphus strepsiceros) and birds are often victims of tragic accidents, which can end badly for humans too. With the help of motivated volunteers, we started to cut back the trees along the road. It was a lot of difficult physical labour but we’re starting to make progress. Besides, you can’t put a price on the feeling of knowing that this task will save animals’ lives. Every year, the bush is different and every day is a new adventure here in Botswana! I remember overlooking the bush and seeing a family of elephants from the top of Signal Hill two years ago. I remember this moment so clearly because we saw a baby elephant that was only a few months old and was so weak that it was struggling to follow its emaciated mother. It was extremely difficult for us because we knew that this poor baby would most probably pass away due to the lack of food. The winter of 2012 was very difficult for the wildlife as there was little rain so the vegetation was depleted and animals, especially kudus and impalas, struggled to obtain enough food to survive. We helped them by cutting down high branches and giving them hay but this was of little impact overall. In comparison, this winter has been very lush and the animals have had an abundance of food. The summer rain has been plentiful and we can see its incredible effect on the reserve and the vegetation. There is more than enough food and all the animals are in great shape. We have photographic evidence of the difference between the years. Back in 2012, there were no leaves on the trees or grass on the ground. Whereas in 2014, the mopane trees have kept their leaves and the earth is still covered in yellow grass. We are trying to encourage people to realise that small changes can make a huge difference! Small rivers flow into a big ocean. The baobab (Adansonia digitata) is an iconic tree of the bushveld, which lives for millions of years and reaches great widths. It is believed that a tree with a diameter of five metres is about 1,000 years old. About one hundred baobabs grow at Wild at Tuli; the oldest of them being just under 1,000 years old. Despite its rather large stature, some trees need a little help from our volunteers to protect them from thirsty elephants. Two baobabs were taken care of this month. While the heartwood is pulpy, fibrous and has no use as firewood or building materials, it is very popular among elephants. 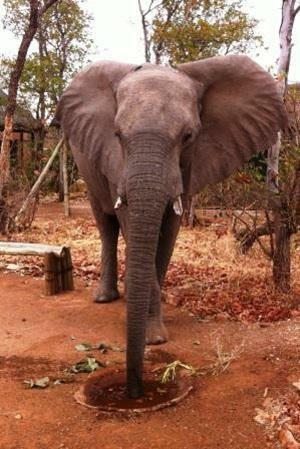 40% of the wood is made up of water so elephants tend to use it as a refreshment stand over the dry season. They dig at and peel the tree to chew on its moisture. As a result, some trees have been deeply marked by the elephants. While baobabs are quite resilient, they would not survive excessive damage by elephants. After testing different methods of protecting the tree, we opted for a simple but effective technique. This involved volunteers scattering pointy rocks, which were about 3 metres wide, around the trees. This is a durable and non-invasive technique that does not endanger the animals or the environment. The wide distance prevents elephants, which dislike walking on sharp stones or unstable ground, from reaching the bark of the tree. 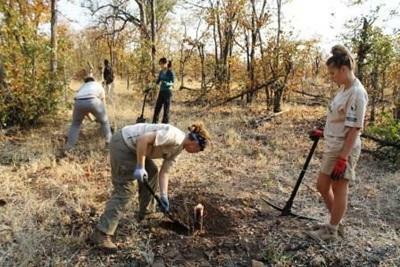 We also made sure to leave enough trees to quench the elephants’ thirst given that elephants and baobabs have survived together over the course of history. All the volunteers involved put in a great amount of effort and energy to this project. We stopped counting just how many rocks we lifted but it was worth it. We have recently gone to great lengths to create a new road on the northern side of the reserve to offer a scenic alternative to the main road. The new road runs in between kopjes, from the top of which we will be able to spot rare wildlife such as leopards (Panthera pardus), brown hyenas (Parahyaena brunnea), spotted hyenas (Crocuta crocuta), hyrax (Procavia capensis), klipspringers (Oreotragus oreotragus) and even African elephants (Loxodonta africana), which are pretty good climbers. The view from the road is amazing with kopjes on both sides and a nice view of the surroundings. However, it was not an easy job! Volunteers had to cut down trees and remove stumps and rocks but, thanks to their help, the 600 metre long road was completed in less than a month. Well done to everyone involved in improving the reserve’s driving lanes! We are happy to announce that we have identified two new members of the reserve’s leopard family, which now counts 14 members among its brood. Leopards (Panthera pardus) are amongst one of the rarest animals in the reserve and are nicknamed the “Holy Grail”. They are shy, nocturnal animals and difficult to spot. Often confused with the cheetah (Acinonyx jubatus), the leopard is a powerfully built cat with rosettes or broken circles of irregular black spots. This cat is built to carry heavy prey up trees with its powerful neck and jaw. They can live in a myriad of habitats and feed on whatever is most available in the area. At Wild at Tuli, the main staple is the impala (Aepyceros melampus). To identify a leopard individually is not an easy task. Each leopard has a uniquely patterned spotted coat and characteristics that distinguish it from others. It is a long and difficult process to analyse every picture collected from either sightings or camera traps. 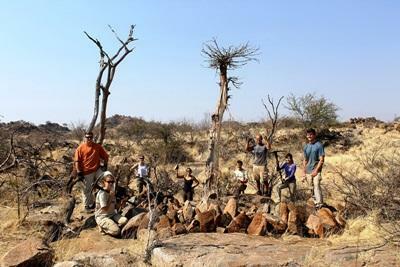 To date, 14 leopards have been identified at Wild at Tuli. Each of them has their own identification file, which includes details about their spots, features, territory and sightings. Our aim is to understand the present population and their movements, as well as review the population’s evolution.